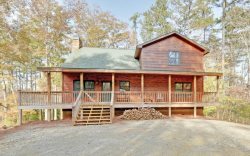 Majestic View is a gorgeous and luxurious Blue Ridge Mountain cabin, perfect for a memorable North Georgia Mountain escape. Treat yourself to all the finest finishes and amenities while in a cozy rustic setting. This North Georgia vacation rental is perfect for the whole family, just the two of you, or three couples. Outside around the cabin you will be amazed at the beauty of the land while taking in the breathtaking mountain views. Relax outside by the wood burning fireplace, or soak your worries away in the hot tub located on a covered deck. This gorgeous and super roomy property is designed with family vacationing in mind. This cabin offers a Prow Front which increases the view and the interior space. The large open concept main floor with a huge floor to ceiling rock gas fireplace. The kitchen, dining room, and living room are all open to each other for great family time amongst everyone. In the kitchen there is custom cabinetry, stainless steel appliances, and granite countertops. There is an additional living room on the lower level that also features a custom wet Bar with sink. Majestic View is located about fifteen minutes from Downtown Blue Ridge, and has very easy access by most any vehicle. The cabin has long range panoramic views. • Arcade Machine - Featuring PacMan, Centipede, Donkey Kong, ETC. Perfect 4 day stay in Majestic View! The team was an absolute delight to deal with. We had scheduling issues and the team was very accommodating and responded to every email promptly and pleasantly. Throughout my reservation process, everyone that I spoke to was very helpful and courteous. I especially remember speaking to Rochelle the last few conversations. Oh my goodness!!! Beautiful views no matter where you were...inside and out! The staff was great! They responded to all of my emails in a timely manner. Check in was great and the employees were very personable. Words cannot describe the beauty of the property! The view is amazing. My family loved the privacy and seclusion of the property. The cabin is absolutely beautiful. Our favorite place to gather together was outside in front of the fireplace on the covered porch. There was plenty of room for all of us to sit and just relax. And the view was AMAZING! We stayed at Majestic View and those words just don't describe this cabin. It is so much more. You walk in and look out to picture perfect views,through floor to ceiling windows. You can really unwind on the wrap around porch and take in the breathe taking views. The cabin has all the bells and whistles,hot tub, video games,tv's in all the rooms,and all your kitchen needs. Everything was spotless. And it is so roomy,ample took to sleep my family plus some. All the areas I wanted to visit are in close proximity to the cabin. I didn't have to see them, but had very helpful information from booking through departure. Georgia Mountain Cabin Rentals are great. Top notch service!! I would highly recommend Majestic View cabin to any family whether big or small, it certainly has an ample amount of space no matter what the size. The outdoor space is peaceful and relaxing with beautiful views to boot. Living space is cozy and inviting, my family felt right at home. Majestic View is a lovely cabin, can't wait to get back!! Everything was EXCELLENT! Thank You ! Helpful and friendly staff; everyone was very helpful and knowledgeable. Provided great advice on accommodations and places to visit. Paul came out and addressed our oven issues quickly. Was a great cabin for our family of 4. Kids stayed in bunk bed on lower level, 2 master bedrooms (main level and loft). "Majestic View" did not disappoint. The view was beautiful and the cabin was exceptional for our family of 4 adults and 2 toddlers. We didn't want to leave! Great cabin, and the communication was excellent whenever I called in with questions. I only wish we could have stayed longer! Beautiful cabin! The view was majestic, the name does it justice. The cabin was spacious and not too far from downtown. I had a really pleasant experience from the company, the stay and the property. Love Love Love Majestic View!! There are three things I look for when vacationing (nice bed, good water pressure and hot hot water) and Majestic View did not let me down.I'm already looking at dates to come back. Thank you, I really enjoyed my stay. The staff was friendly and helpful from start to finish! Majestic View is a beautiful property inside and out. The property was very clean! Excellent. Beautiful view, wonderful outdoor space (sitting area on deck with fireplace was the most used area)!